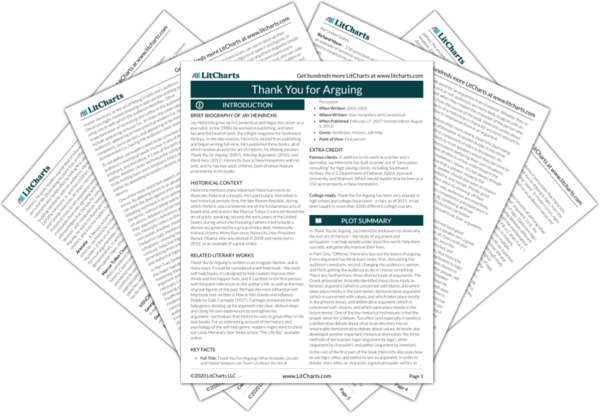 Instant downloads of all 945 LitChart PDFs (including Thank You for Arguing). One of the most common rhetorical problems is an inability to sympathize with the audience’s point of view. People often make speeches that persuade them of their own point, but which don’t exemplify the audience’s values. A good rhetorician will make an argument in terms of what’s good for the audience, not the rhetorician. Rhetoricians need to stay apprised of their audiences: they need to learn what kinds of values, words, and mannerisms their audiences expect. Otherwise, they run the risk of persuading themselves, but nobody else. When making an argument, you must persuade the audience that what you’re advocating is advantageous to them. But it can be difficult to do so: your audience could “stonewall” and refuse to budge. This is a problem of logos: the audience has made up its mind and won’t rethink the issue. For example, Heinrichs’ sister in law, Annie, tried to persuade a friend, Kathy, to vote Democratic—but Kathy refused, on the grounds that the Republicans wouldn’t raise taxes, and the Democrats would. Nothing Annie said could sway Kathy. Most stonewalling begins with demonstrative rhetoric: people refuse to budge when they feel that a persuader is making an appeal that goes against their core beliefs. However, Heinrichs will show how Annie can sway her friend Kathy by ignoring deliberative rhetoric and instead trying to appeal to Kathy’s decision-making process, situated in the future tense. Before an argument, it’s important to find words and phrases that reflect the audience’s core values—in a word, “commonplaces.” Commonplaces can be useful rhetorical devices—for example, when a politician says, “All men are created equal,” he can get the audience on his side without going to the trouble of defining what he means by “created” and “equal.” Filmmakers love using visual commonplaces—for example, when a character in a film has a scruffy face and a glass of whiskey, that means he’s probably an alcoholic. Crafty politicians have manipulated commonplaces to persuade their constituents: for example, the No Child Left Behind Act uses the commonplace that all children should get a shot at a future to persuade people to support a specific educational agenda. Heinrichs argues that Republicans have proven to be better at manipulating commonplaces than Democrats. Commonplaces can be very useful rhetorical devices, because they compress a lot of meaning and complicated ideas into just a few seconds of material. The strength of commonplaces, however, is also a danger: politicians can immerse themselves in commonplaces even if they’re not really members of the group from which the commonplaces originate. In this way, a politician can use commonplaces to manipulate an audience into thinking that there’s more of a connection between the politician and the audience than there really is. It’s important for a rhetorician to adapt to an audience’s commonplaces. When Annie was trying to persuade Kathy to raise taxes, she could have agreed with Kathy’s complaints about the Democrats and taxes, identifying her audience’s commonplace. Then, she could have argued that the Republicans would raise taxes too, and perhaps convinced Annie to at least read some articles about politics. Annie moves the argument forward to by conceding Kathy’s point about the Democrats; however, instead of stopping there, she makes a closely related point (both Republicans and Democrats will raise taxes) which, because she agreed with Kathy, Kathy will find much harder to rebut. Political commonplaces compress a lot of culture into a few short words, meaning that they offer up a brief history of American politics. Commonplaces may leave out a lot of details, but they’re a great entryway into a deeper argument. Arn, Jackson. "Thank You for Arguing Chapter 11: Gain the High Ground: Aristotle’s Favorite Topic." LitCharts. LitCharts LLC, 2 May 2017. Web. 23 Apr 2019. Arn, Jackson. 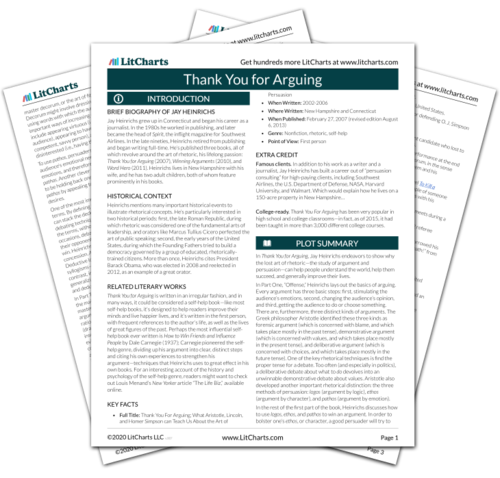 "Thank You for Arguing Chapter 11: Gain the High Ground: Aristotle’s Favorite Topic." LitCharts LLC, May 2, 2017. 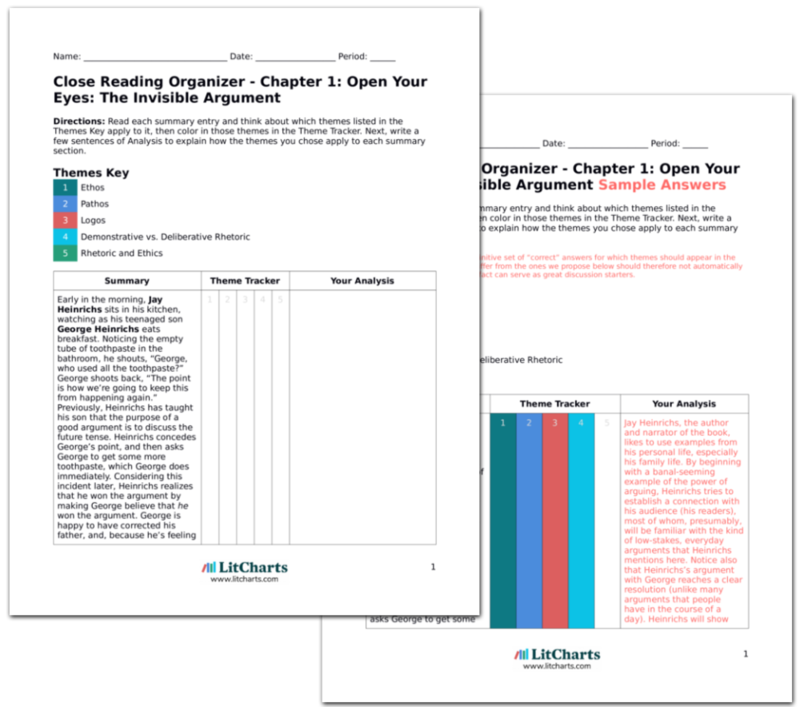 Retrieved April 23, 2019. https://www.litcharts.com/lit/thank-you-for-arguing/chapter-11-gain-the-high-ground-aristotle-s-favorite-topic.